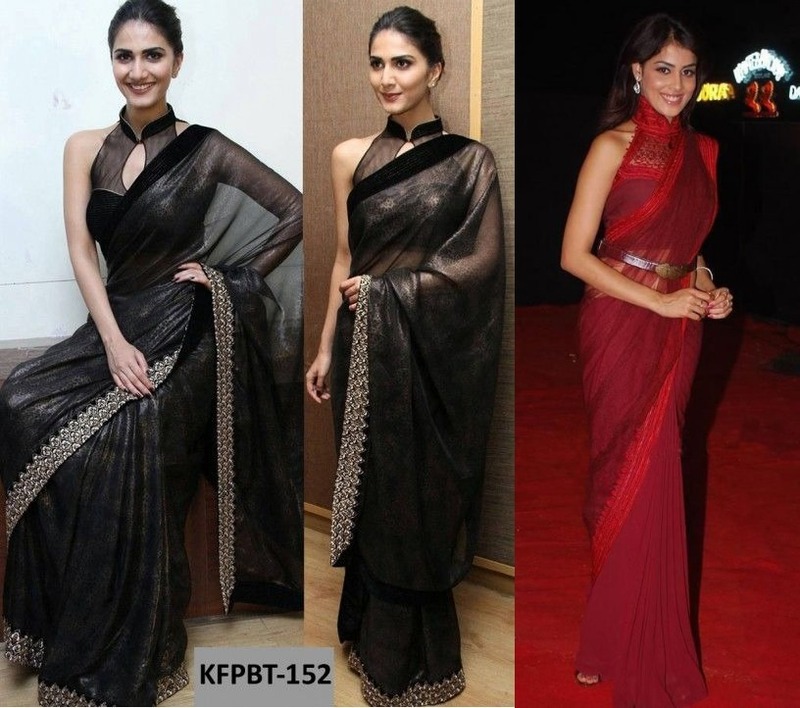 Saree is one of the most sexiest garment on earth which can be done in so many designs, drapes and style. 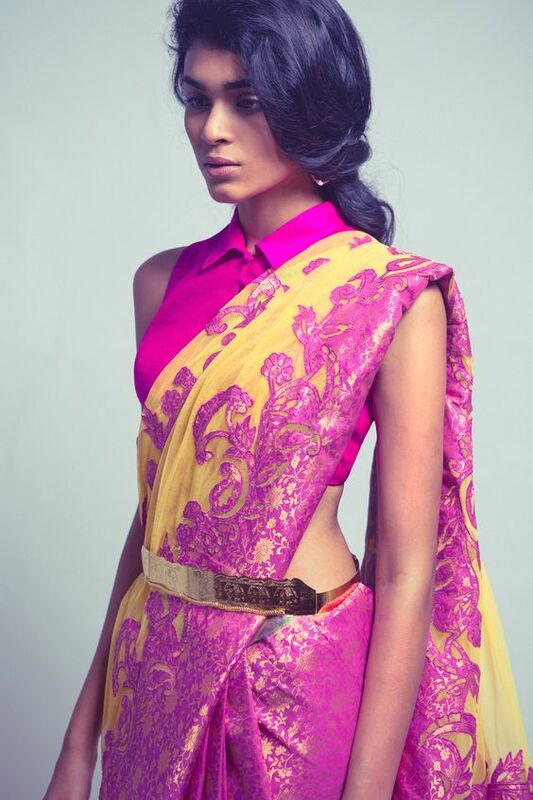 But the blouses which we team up with them matter the most, as a good piece of a blouse takes the look to another level. 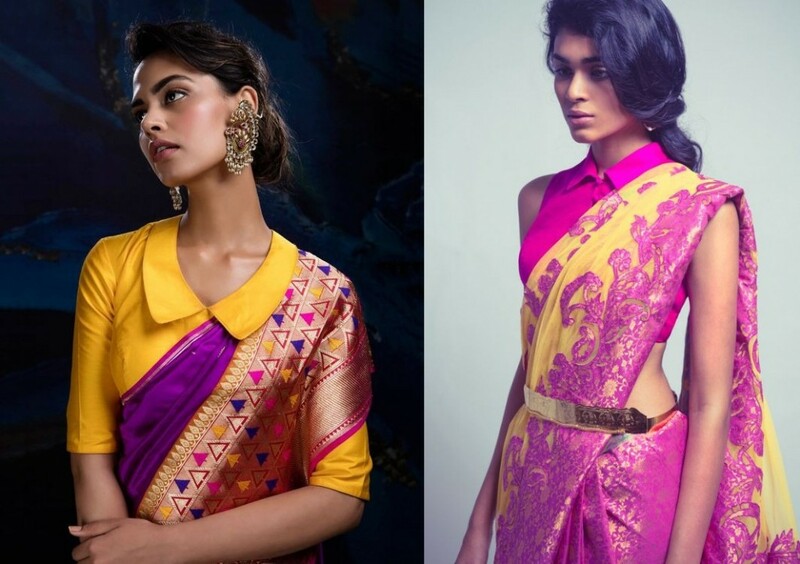 No matter how beautiful the saree is, if it is not matched with a proper cut and a nicely designed blouse all goes in vain. There are different necklines for the blouses, but a nice collared one has its own grace. Here are few blouse styles which can be done with collars…. Front zipper style– Zippers are popular nowadays as a fastening tool for all ethnic wear styles. Be it kurta, kurti or a simple blouse, use it at the front opening , you can go in for fancy zippers with crystals and other fancy designs. A fully closed front or a V neck with a nehru collar, both look interesting. Halter style with collar– Halter blouses look smart and are good for young girls who want a modern approach for their look. 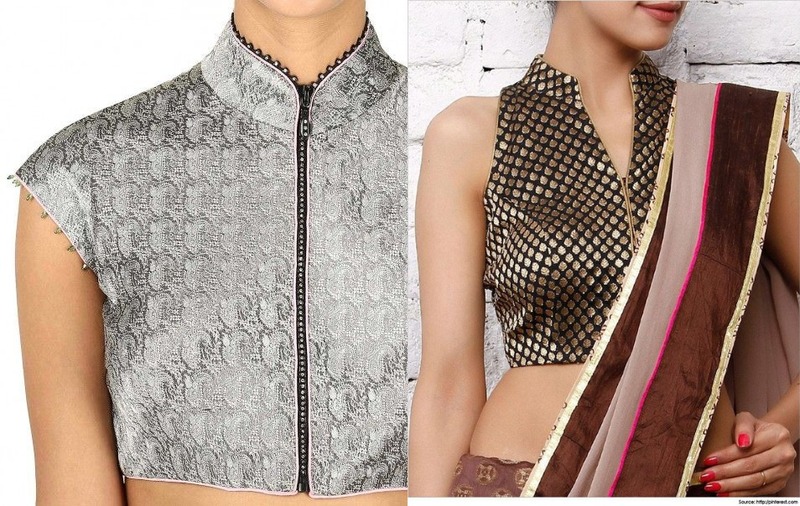 Try it with a thin or broad nehru collars, for making the style more interesting try using a sheer material like a plain or embroidered net or a tissue, for upper front panel like in the pictures below. Get inspired by shirt collars– Well the shirt collars are not meant only for western wear, but it can also be used on Indian blouses for a contemporary look. A shirt collar set on V-neck without a collar stand is apt if you want a low neckline, whereas the normal shirt collar can be used with sleeveless or halter neck blouses. Open Back cut– This is a nice style for the people who want to wear collar styles but also want to have a basic neckline in addition to wear neck pieces. It is basically an inbuilt collar which looks like a normal neckline from the front and extends as a collar at the back. Back can be fully covered with all over back opening or a deep cut like in the picture.